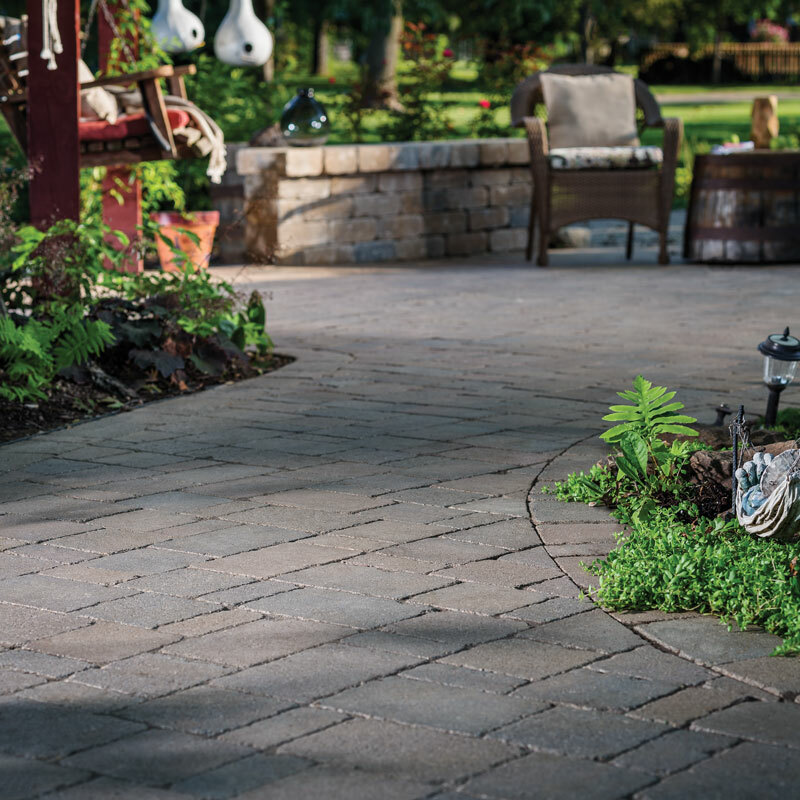 Part of the industry since 1949, Northfield is a leading manufacturer of concrete masonry and hardscape products in the Midwest. Quality and service have long been the hallmarks of our dedicated and creative teams of craftsmen. We continually strive to provide products that will meet and surpass the needs of today’s design community. State-of-the-art-facilities across the Midwest feature automated processes that create a diversity of custom products. 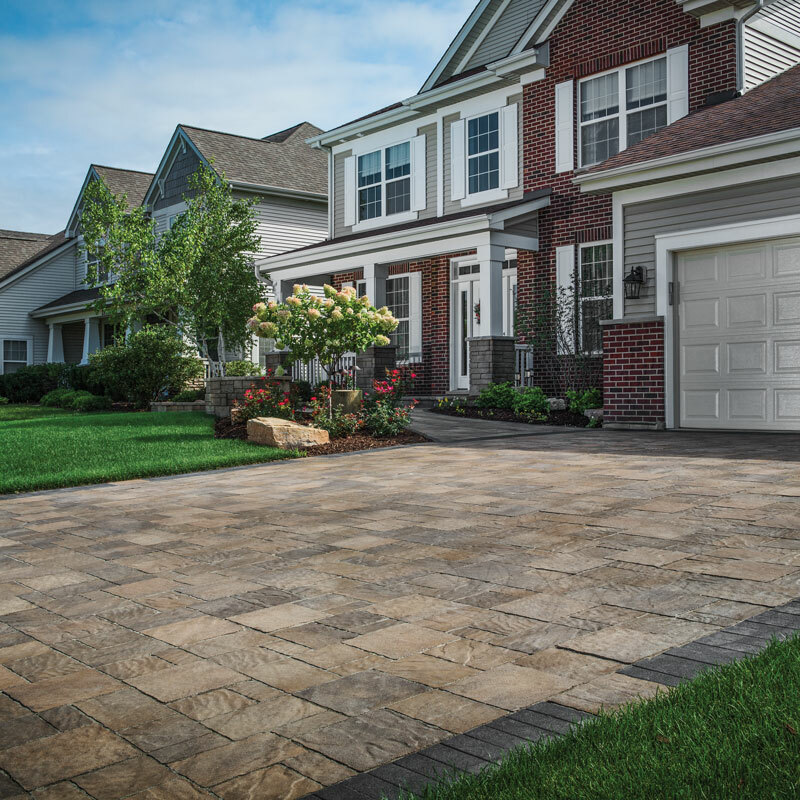 Cordova Stone, Franklin Stone, Harvard Brik, Waterford Stone, and Belgard Pavers and segmental retaining walls are among the wide pallet of products Oldcastle APG produces. Northfield, a subsidiary of Oldcastle APG, a CRH company, is a leading provider of AIA/CES approved programs. To schedule an AIA or NCMA Continuing Education presentation at your architectural office, call Oldcastle APG 1-847-949-3600 or email. This Sustainable Design and Health, Safety and Welfare presentation discusses Green Building Sustainable Design benefits including life-cycle costs. Changes in LEED 3.0 and how building with concrete masonry contributes to Green Building and Sustainable Design are also addressed. Attendees will learn how concrete masonry can contribute to specific LEED 2009 credits and the health, safety and indoor comfort of the occupants. Glazed concrete masonry units (CMU) are a safe, clean alternative to structural glazed facing tile (SGFT) and ceramic tile. This HSW program addresses sustainable design as well as the LEED® points that may be achieved using glazed CMU. Architects will understand why concrete masonry units have a high impact on their safety objectives. In addition, this program enables architects to effectively understand why glazed CMU is “the healthy choice” in terms of how it impacts both building inhabitants and the environment. This presentation meets the AIA requirements for a one-hour Health, Safety and Welfare credit. Concrete blocks are not just for foundations and basements. Architectural masonry units are animating the facades of schools, supporting columns of healthcare facilities and gracing the arches of shopping malls. This program will cover the vast range of masonry units available and their potential uses. Designing and building masonry structures to look good for the life of the building enquires a fundamental understanding of the enemies of masonry and proper detailing to protect your walls. This discussion on critical detailing and project management will ensure lasting beauty of masonry units. Concrete masonry is an effective solution for the ever-changing design environment. In this HSW program, the importance of test reports and their relevance to design and sound construction of the building envelope is explained. This program also addresses how good masonry practices can assist designers in achieving the objectives of Green Building and Sustainable Design. Also addressed are the proper techniques to create effective results with building acoustics, the importance of Fire Ratings and the impact on public safety. This presentation meets the AIA requirements for a one-hour Health, Safety and Welfare credit. This one-hour HSW program will explore how to effectively design masonry walls using proper design techniques focusing on the prevention of moisture, cracking and cleaning issues. This building design focus is on planning and designing sound masonry walls using proper architectural structural components based on industry guidelines and specifications. Attendees will learn why walls crack and how to design to eliminate unnecessary repairing and cleaning of masonry walls. This presentation meets AIA requirements for a one-hour Health, Safety and Welfare credit. Touring Oldcastle APG’s manufacturing facilities in Illinois can earn AIA Continuing Education credit. Each plant tour earns one AIA credit. 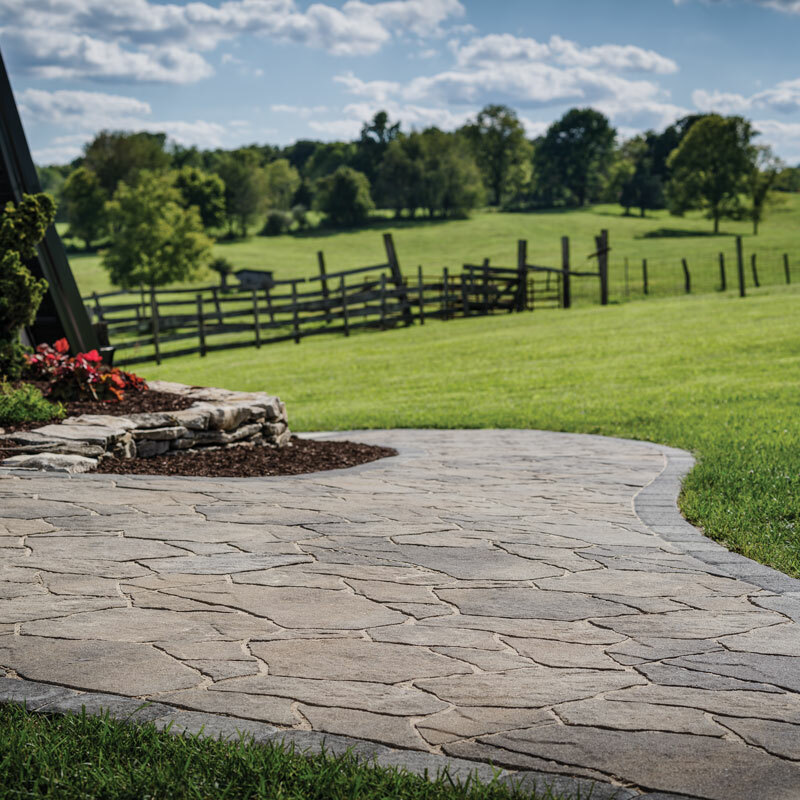 Through innovation and design of quality products, Oldcastle APG can help you go green. 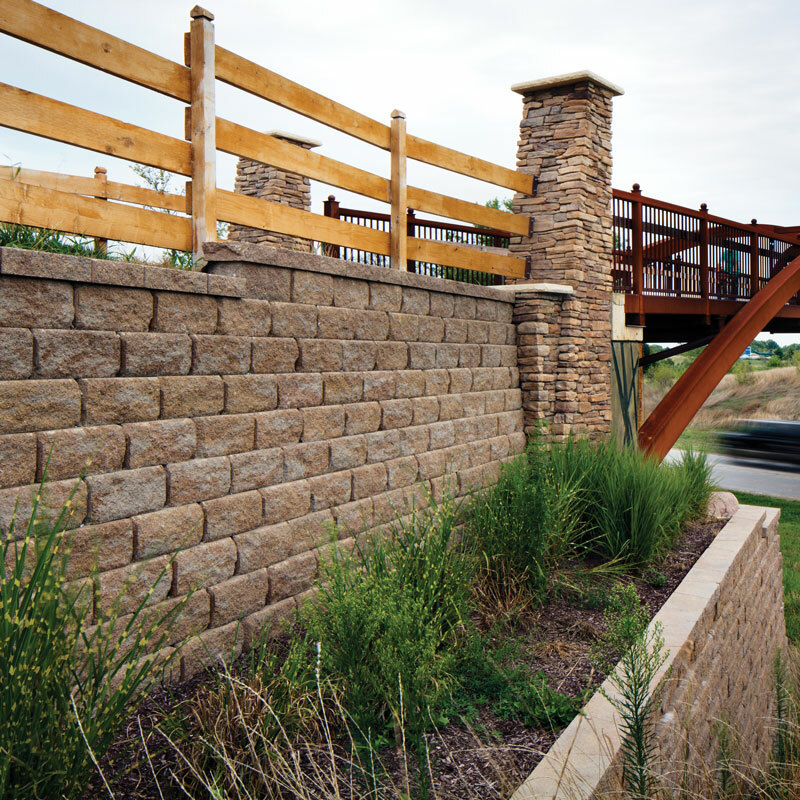 Introducing Chicago Green, a new line of masonry units with post-consumer recycled content. 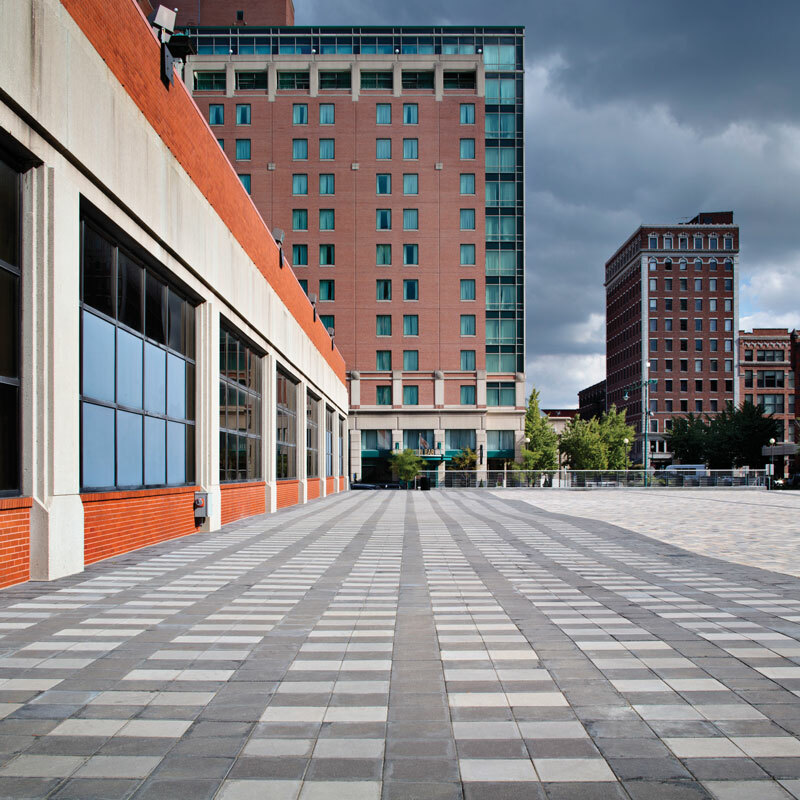 Increase your LEED® project points count with these masonry units. Since early 2009, Northfield, a subsidiary of Oldcastle APG, a CRH company, has been investing in research and development to find the optimum recycled material to add to pre-finished concrete masonry units. Recycled glass that originates from the City of Chicago’s waste stream can now be added to these masonry units. Northfield works closely with the glass recycler to create a very specific aggregate gradation of glass. The glass is first sterilized at high heat temperatures, and then ground by a proprietary process into very fine glass aggregates. The glass aggregates are then incorporated into the masonry unit mix designs. Chicago Green masonry units deliver excellent performance, and consistent high-quality that exceed industry standards. 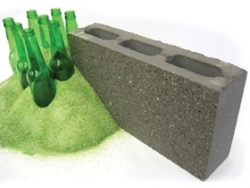 Each 4-inch Chicago Green concrete masonry unit (cmu) contains up to 20% post-consumer recycled glass aggregate (by weight). The recycled content in each single 4-inch cmu is equivalent to 8 glass bottles. Specifying Chicago Green can make a significant contribution toward achieving LEED® Materials and Resources Credits for Recycled Materials 4.1 and 4.2. Oldcastle APG has conducted extensive research and testing with the Concrete Technologies Laboratory (CTL Group) in Skokie, Illinois and the National Concrete Masonry Association Research and Development Laboratory (NCMA) in Herndon, Virginia. The NCMA/CTL Group final test summary has been published, and is available from Oldcastle APG. Contact Oldcastle APG for details. 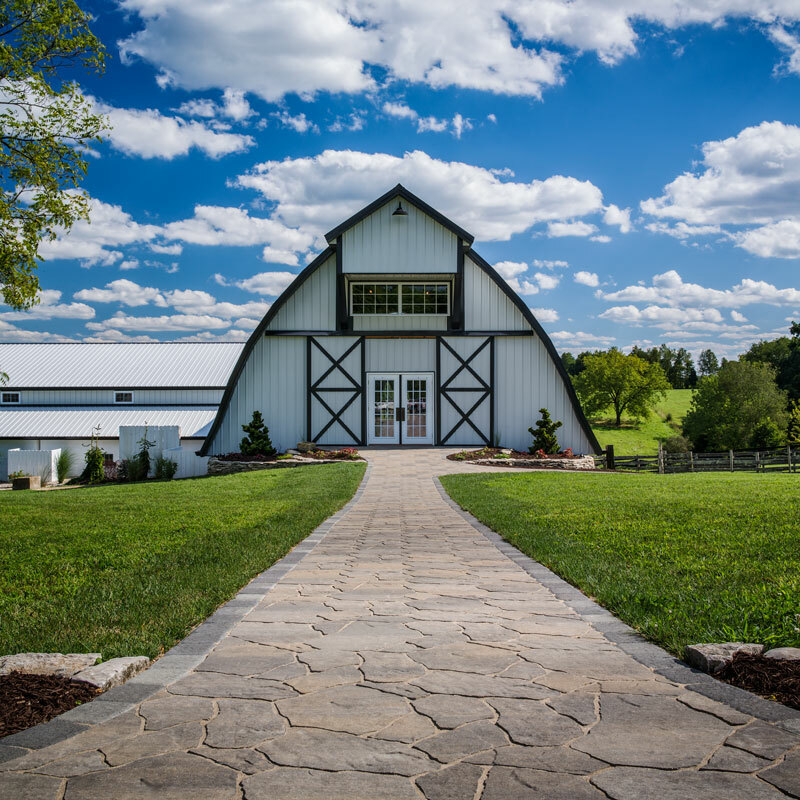 Oldcastle APG is committed to the continual development of high-quality products that facilitate green design and sustainability, creating products that have less environmental impact and lower life-cycle building costs. Our masonry products offer: recycled content, increased energy efficiency, low life-cycle costs, improved air quality, better acoustical environments and improved safety and security compared to other materials. 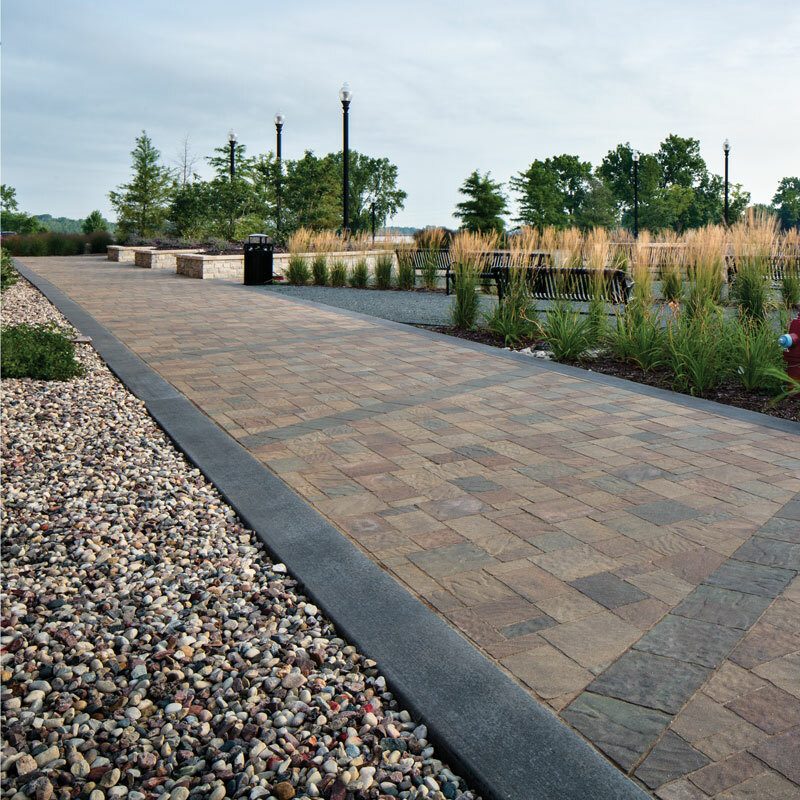 Customers can choose from a comprehensive line of concrete design options. They can see how these products can work together to meet their needs. Description: Determined by weight (%), the sum of the post-consumer recycled content plus one-half of the pre-consumer recycled content constitutes at least 10% (based on cost) of the total value of all materials used in the project. Description: Additional point for adding more recycled content. Determined by weight (%), the sumof the post-consumer recycled content plus one-half of the pre-consumer recycled content constitutes an additional 10% beyond Credit MR 4.1 (20% total) based on the cost of the total value of all materials used in the project. Oldcastle APG can produce concrete masonry units (cmu) that contain a significant amount of both pre-consumer and post-consumer recycled content. Description: Materials are regionally extracted, processed and manufactured within 500 miles of the project site. At least 10% (based on cost) of the total materials used on the project must be extracted, processed and manufactured within 500 miles from the project site. Description: Regional Materials An additional 10% beyond Credit MR 5.1 (20% total based on cost) of the total materials used on the project must be extracted, processed and manufactured within 500 miles from the project site. 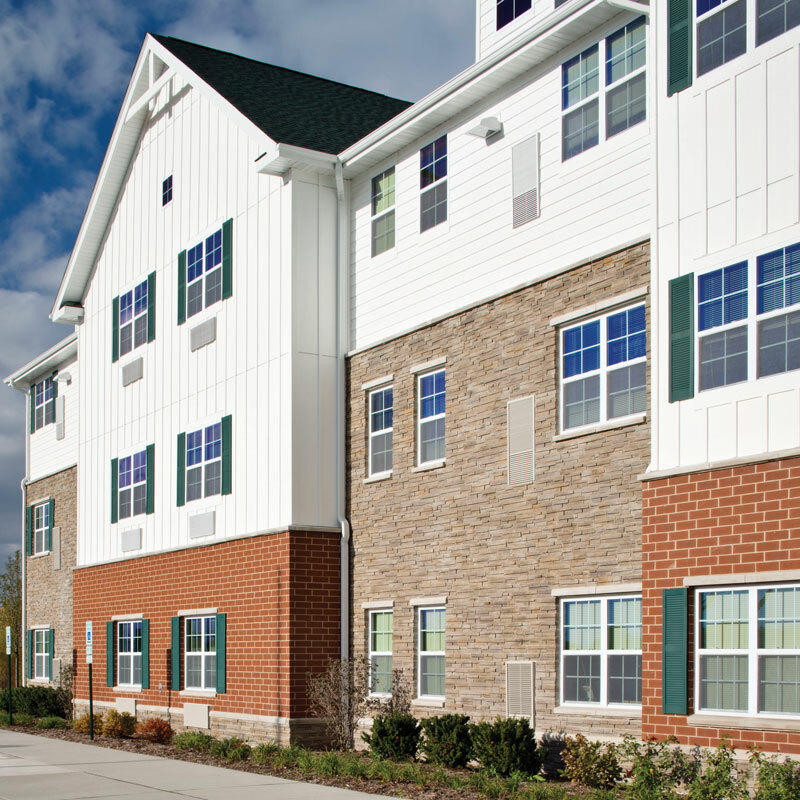 Oldcastle APG offers attractive and affordable masonry construction options that are manufactured locally. Description: Description: Reduce the quantity of air contaminants that may negatively impact a structure’s indoor air quality and therefore improve the health and well-being of the occupants. 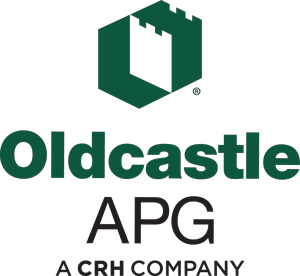 Oldcastle APG's sealant used on ground face concrete masonry units emits low VOCs, therefore, reducing indoor air contaminants that are odorous, irritating and/or harmful to the comfort and well-being of installers and building occupants.